The studio behind South Park: The Stick of Truth and Star Wars: Knights of the Old Republic 2 could have had another big pop culture game adaptation to its name: Game of Thrones. Or technically, A Song of Ice and Fire, since the offer from Electronic Arts came way back in 2005 (pre-dating the HBO series by six years). Unfortunately, Obsidian co-founder Feargus Urquhart told Eurogamer that George R.R. Martin's series didn't match up with the kind of fantasy his studio was interested in. Tl;dr: too many characters, not enough kobolds. "My feeling was, understanding the IP at the time, it's about this political intrigue, and people's connection to the IP is to all these characters - that's how the books are written, each chapter is a person and what's happening to them," Urquhart said. "Other than what weird stuff is going on beyond The Wall, and the dragons, and some hint [of fantasy/magic], there are no magic users, there are no clerics, no thieves. Basically there's dudes with swords and armour and a little bit of mysticism, but within the mainland there's no goblins, no kobolds..."
It wasn't really clear what important things one player could do in this world without dipping into large-scale strategy. Keep in mind that Urquhart and company made this decision long before the last few seasons of Game of Thrones showed just how fantasy-action-packed Thrones could be, with bastards swinging swords everywhere and dragonflights torching legions of troops. The source material didn't line up with Obsidian's interest in open-world RPGs. "Looking back at it, the only thing we could have done is what BioWare did with Knights of the Old Republic," Urquhart said. "They basically said Episodes 1-6, you can't touch it, so we're just going to go way back. But even then some stuff had already been written about it in the [Star Wars] Expanded Universe. 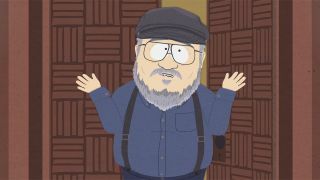 With George R. R. Martin there was no other... they talked about some history... we could have done that." We may never get to play Obsidian's take on Westeros, but at least we can keep dissecting the Game of Thrones season 7 finale's ending.